Live Industrial presents the BEL 505, an extremely compact semi-automatic case erector and pack station designed specifically for applications on manual case packing lines. 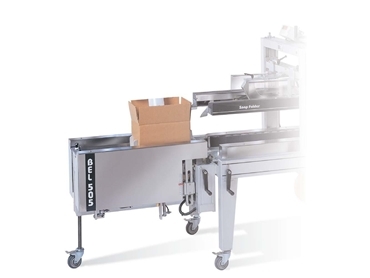 When connected to BEL case sealers, BEL 505 case formers allow a single person to form, pack and seal corrugated cases in a single operation. The BEL 505 semi automatic case formers and pack stations provide an economical and effective way of eliminating manual labour required to pre-form cases for hand packing lines at a fraction of the cost of fully automatic case erectors. The BEL 505 semi automatic case former and pack station is ideal for installation in manual case packing lines, improving productivity as well as safety and eliminating extra labour needed to set up and close case bottom flaps prior to loading. Safety is improved in the manual case packing lines with the elimination of repetitive strain injuries. A case hold-down feature facilitates hands-free case loading on the packing line by keeping the box in place.